Custom wave rubberized imprinted sunglasses can create waves in your next promotional campaign with its cool , colorful and vibrant form. Personalized wave rubberized imprinted neon sunglass offered in this collection are created from recycled and rubberized plastic material. The sunglass offers complete protection from UVB and UVA components with its UV 400 lenses. 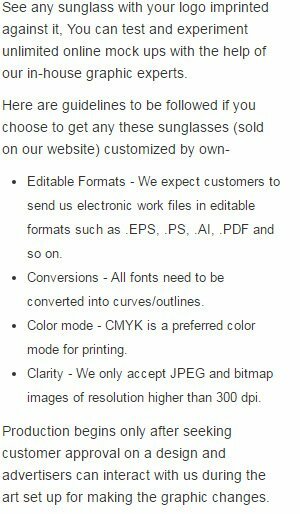 A promotional rubberized imprinted neon sunglass makes a wonderful business gifting choice in all seasons and it can be sought in 7 differing colored temples – Black, White, Neon - Blue, Pink, Orange, Green & Yellow.